Miami Herald, page 1A, Jan. 30, 2015.
de·pend·ence - (1) the state of relying on or being controlled by someone or something else. (2) reliance on someone or something for financial support. The Random Pixels Quote of the Day comes to us from today's page one story by Miami Herald reporters David Smiley and Chuck Rabin. 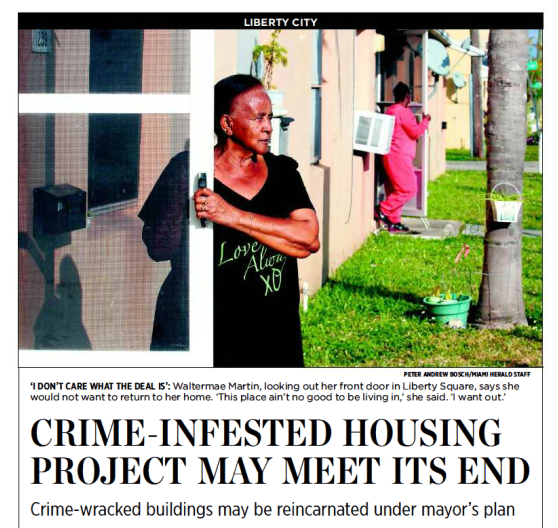 The story talks about Miami-Dade Mayor Carlos Gimenez's plans to demolish the crime-plagued Liberty Square public housing project, aka the Pork and Beans. Smiley and Rabin also quote long-time resident Waltermae Martin, who has lived in the Liberty Square projects since 1973. "Any male in Fort Lauderdale who is not pursuing a cute female will automatically land in jail. That's the law in Fort Lauderdale." - From "Girl Happy" - 1965. Miami Daily Metropolis, Dec. 10, 1920. 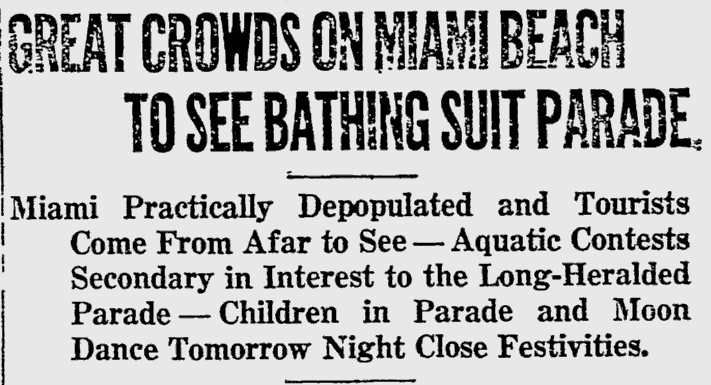 In its Dec. 10, 1920 afternoon editions, the Miami Daily Metropolis breathlessly reported that the city of Miami had been "practically depopulated." The draw was "the most exciting event of the year," as the Metropolis termed it; a bathing suit parade on Miami Beach featuring "stunningly, if thinly-clad beauties." The Metropolis noted that more than 1,000 cars had parked near 22nd and 23rd Streets. Cars from Palm Beach, Orlando, Ft. Pierce and Kissimmee "were present in great numbers." And there was this tidbit: "Among the features of the bathing suit parade was 'The Evolution of the Bathing Suit,' portrayed by four women" with one lady wearing an 1890s bathing suit with "full puff sleeves and long bloomers showing beneath the ankle-length 17-pound skirt. A straw hat with ribbons beneath the chin completed the costume, which brought many a laugh." Photograph by William Fishbaugh via Library of Congress. In October 2012, after seeing a video of Miami Herald political reporter Marc Caputo trying to question Sen. Marco Rubio, I wrote, "After watching Marc Caputo question [...] Rubio, I'm convinced Rubio is guilty of something." Caputo was trying to ask Rubio about the ongoing criminal investigation of his pal, Rep. Ravid Rivera. But as Caputo wrote at the time, "Rubio preferred to get rained on Monday than answer questions about a criminal investigation into his long-time friend and ally, Congressman David Rivera." The entire thing was caught on Caputo's handi-cam. But the video, and a dozen or so other Caputo cinematic mini-masterpieces disappeared when the Herald began hosting their videos on YouTube. And that's a shame, because one of Caputo's talents - in addition to writing about politics - was shooting incredibly revealing videos that featured some of the Sunshine State's shadier politicians in starring roles. Some of Caputo's videos have survived, including this classic (below) from 2011 when Caputo tried to get then "presidential candidate" Herman Cain to explain the so-called "wet-foot, dry foot" policy. However, most true aficionados of Caputo's work consider 2014's "Email me" video (embedded at the top of this post) to be his magnum opus. 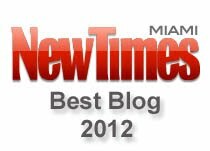 Tim Elfrink of Miami New Times calls the video "beautifully awkward," writing, "Caputo hounding Rivera about the ongoing federal probe he'd broken and Rivera repeatedly muttering, "Email me" -- is a perfect example of the tenacity, humor, and shoe-leather reporting the political writer has brought to the Miami Herald for the past 12 years." But if you're a fan of Caputo's work, you'll soon have to look elsewhere. Shortly after 7 this morning, Caputo announced on Twitter that he was leaving the Herald and taking his talents to the website, Politico.com. Here's the email Miami Herald executive editor Mindy Marqués sent to the newsroom. We're sad to announce that Marc Caputo is leaving the Miami Herald to join Politico as a Florida-based political writer. 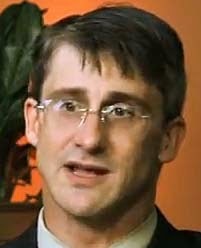 Marc first joined the Herald in 2003 to work in the Tallahassee Bureau. Before the Herald, he had worked at newspapers in Key West, Naples, Arizona and West Palm Beach (Palm Beach Post). He stayed in Tallahassee until 2011 when he was named the Herald’s political writer and columnist. Marc is both a talented writer and a relentless reporter. And his passion for politics turned him into a brand name in Florida. Whether it was writing for the Herald’s front-page (hard to recall a Caputo story that didn’t deserve a look-at for 1A), the Herald’s popular Naked Politics blog or his 12,000-plus followers on Twitter, Caputo is the go-to reporter to know what’s happening in the zany world of Florida politics. 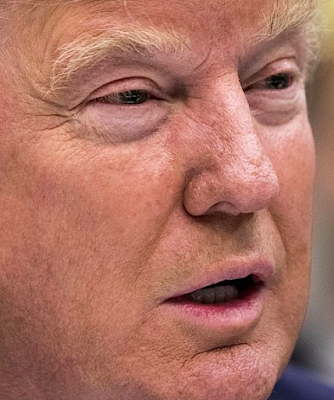 As a Herald reporter, he’s covered major stories -- from the special session on Jeb Bush’s Scripps Florida giveaway to the Terri Schiavo case to 8 hurricanes that slammed the state over a 14-month period. He’s also been a key part of the Herald’s coverage of every major election since 2004 and put people into federal prison with his award-winning investigative reporting of former Republican U.S. Rep. David Rivera. His work, alongside Manny Garcia and Sergio Bustos, earned the Miami Herald a McClatchy President’s Award for journalism excellence in 2012. Please wish him the best in his new job at Politico. With Marc's departure, we have an opening for a Florida politics writer. We are looking for a versatile reporter who loves politics and can cultivate good sources. We need someone who can write a quick feed to the blog just as easily as a meaty Sunday story. Interested? Contact Sergio Bustos or Jay Ducassi. ....Carlos Leiva, Bryan Alexander Catin, and Alberto Valdes Mora. It's been a while since we've welcomed any new inductees into the world famous Random Pixels Losers Corner. So this morning we're making up for that lapse by welcoming, not one, not two, but three new losers. 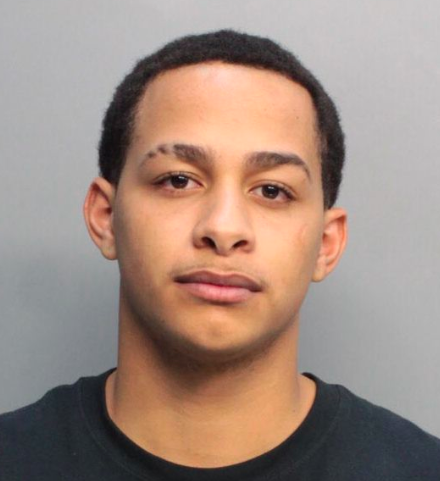 These criminal masterminds were picked up Wednesday by Miami Beach Police detectives Juan Sampedro and Steven Feldman. Now we're not in any way minimizing the fine police work by Detectives Sampedro and Feldman, but it appears that these late-blooming geniuses did everything in their power to make sure the cops found them without too much trouble. Everything except drive themselves to the police station and turn themselves in. Our story begins at 4:40 a.m. last Sunday when Leiva, Catin and Mora were cruising South Beach in Leiva's BMW looking for someone to rob. At 11th Street and Jefferson Court they spotted a guy walking home. ....without provocation the defendant struck the victim on the head with his fist while wearing a set of brass knuckles. The victim fell to the ground and the defendant and co-defendant continued to strike the victim (with the brass knuckles and fists) about his face and head. The defendant removed the victims wallet and keys from the victims pants pocket. The defendant and co-defendant then ran to an awaiting vehicle (2007,BMW, 328i, 4 door with FL plate l32vv). The vehicle was driven by yet an additional unidentified co-defendant. the vehicle sped off southbound on Jefferson court and then lost control while turning on to 9 street from Jefferson court. The vehicle collided into a stationary unoccupied vehicle at which time the airbags on the vehicle deployed thus shutting the engine off. Unable to restart the vehicle, the subjects abandoned it and fled on foot. Miami Beach police responded to the scene but were unable to locate any of the defendants. 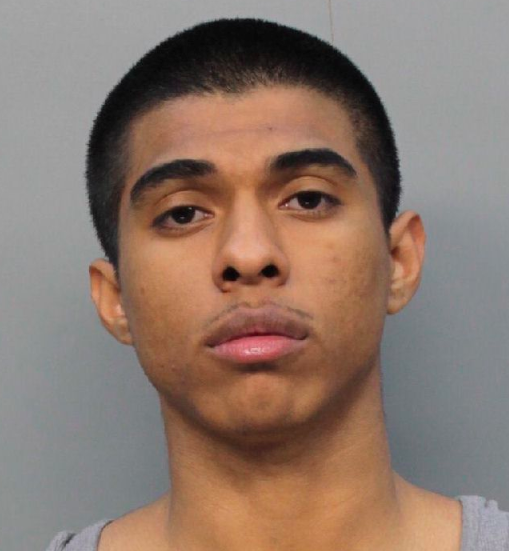 The vehicle was later reported stolen by the defendant (registered owner) to the City of Miami Police Department. So, congratulations, Carlos Leiva, Bryan Alexander Catin, and Alberto Valdes Mora. We've been saving seats for you in the Losers Corner. You deserve them. the Sonny Liston fight in 1964. Miami News, Oct. 1, 1964. 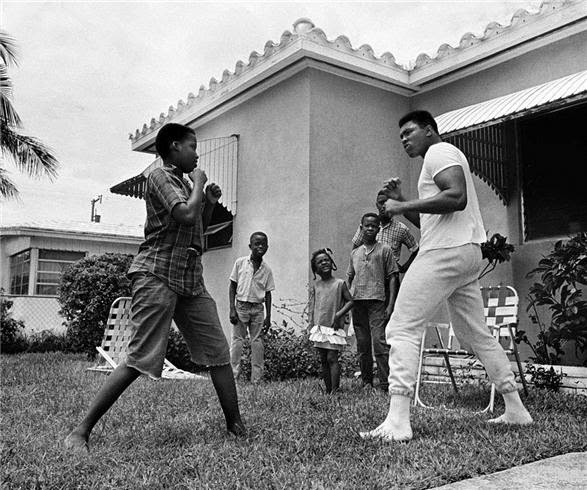 In October 1964 the Miami News learned that heavyweight boxing champ Cassius Clay had bought a gun, a 50-year-old, gold-plated Colt derringer. "He wanted 15 bucks for it," Cassius recalled. "I knocked him down to $5." "Heck, Elizabeth is only the Queen of England, Lyndon Johnson is only the President of the United States, but I'm king of the world," the News quoted Clay as saying. Miami Beach Police Chief Dan Oates needs help. 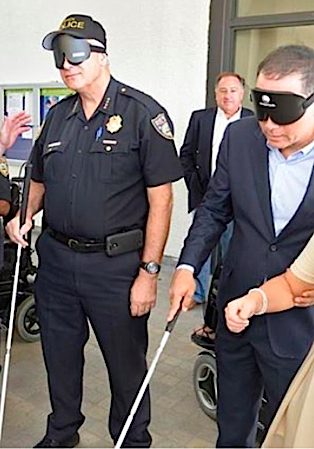 Last April, when Miami Beach Mayor Philip Levine announced that Aurora, CO Police Chief Dan Oates had been selected to be Miami Beach's next top cop, he cited Oates' "tremendous leadership qualities,"
Levine, and City Manager Jimmy Morales were convinced they'd found a lawman who was the modern day version of J. Edgar Hoover and Eliot Ness - a no-nonsense cop who would shake things up and provide some sorely-needed leadership for the city's troubled police department. Now, after just seven months on the job, some within the department are comparing Oates to Barney Fife, instead of Hoover or Ness, and openly questioning whether he was the right choice to lead the department. Critics question Oates' fitness, and point to his lack of leadership and flawed judgment in his seven months as head of a department that's had more than its share of problems. In less than a year, Oates has become the talk of the department following a series of ongoing gaffes that have inspired more than a few derisive posts on a message board frequented by Miami Beach cops. Oates' latest "leadership malfunction" occurred two days ago when he was forced to admit in an email sent out to his department that he had no idea that part of the training process for officers who carry Tasers is that they experience first-hand, the effects of the device. I learned this morning that our Department has a long-standing practice that before any member can qualify to carry a Taser on patrol, he/she must first be shocked by the weapon in training. I don’t agree with this rule. I have been shocked by the Taser, and it is extremely unpleasant. I don’t believe an officer needs to go through that experience in order to be well trained in how to use the weapon. I have instructed Lt. London to discontinue this practice. Of course, anyone in first-time Taser training who still wishes to volunteer to experience the Taser can do so. For your information. We are committed to providing excellent public service and safety to all who live, work and play in our vibrant, tropical, historic community. "I don’t believe an officer needs to go through that experience in order to be well trained in how to use the weapon," Oates wrote in his email. "I have instructed Lt. London to discontinue this practice. " Sources tell me Oates sent out the email Wednesday morning within minutes of learning that Taser training required Miami Beach officers to be tased themselves. "He made this change arbitrarily and without consulting with anyone," a city hall source tells me. "He didn't even bother to check with the city manager or the city's legal department. It's a very bizarre move on his part given the fact that the department is being sued over the use of the Taser. What was this guy thinking?" Shortly after Oates took over last year, he was issued an unmarked Ford Explorer. But in just seven months on the job, Oates has managed to destroy five tires, two wheel rims and the Explorer's exhaust system. How did Chief Oates manage to do this much damage? Oates, despite decades as a cop, has still not learned how to figure out the intricacies of the modern urban parking garage. Seems he has some sort of problem when it comes to avoiding the elevated divider that separates the up and down ramps in the Miami Beach Police Department's parking garage. 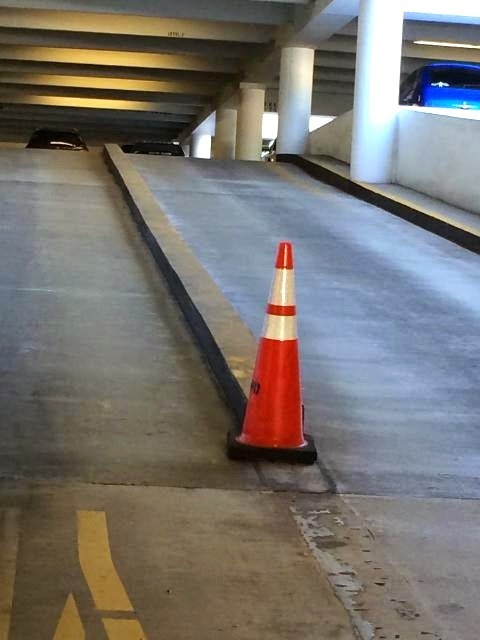 A few months ago, someone placed an orange cone at the entrance to the garage as a visual aid to help Oates prevent further mishaps. On a related note, Oates also uses his city-issued Explorer to travel back and forth to his home in Orlando every weekend. Yes, the man who has trouble pulling into a garage without doing hundreds of dollars worth of damage to his city vehicle, uses that same vehicle to drive to Orlando every weekend. A source tells me that Oates' wife, after visiting South Beach, hated it so much that Oates bought a house in Orlando ... despite the fact that his employment agreement with the city states "his principal residence shall be in the City of Miami Beach." In just seven months, Miami Beach Police Chief Dan Oates has managed to destroy five tires, two wheel rims and the exhaust system on his city-issued Ford Explorer....all while trying to pull into the parking garage at the Miami Beach Police Department. Last year, after a month or so after Oates took assumed command, his daughter visited the Fontainebleau Spa. Sources tell me that Oates gave her his credit card to use. When the 18-year-old receptionist at the spa told her she couldn't use someone else's credit card, Oates' daughter responded by saying, "It's okay, it's my dad's credit card, and he's the new police chief." When the receptionist refused to budge, Oates' daughter called her daddy and put the receptionist on the phone, whereupon Oates let loose with a string of profanities along the lines of "I'm in a meeting and don't have time for this sh*t. Just let her use my card." Word of Oates' meltdown spread quickly within the department after the receptionist told her dad...who is a retired Miami Beach cop. Last July, after just one month on the job, Oates announced that Miami Beach cops would no longer be allowed to work off-duty jobs at Miami Beach nightclubs. 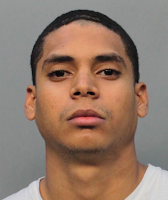 Oates instituted the policy shift following the suspension the day before of a decorated cop for allegedly drinking while working an off-duty job at an Ocean Drive club. Six weeks later, Oates reversed himself. Officers would now be allowed to work off-duty jobs. But the off-duty rules had been changed to such an extent that the department is now having trouble finding officers who want to work the jobs. But it's Oates' latest gaffe that has the boys and girls at 1100 Washington Ave. snickering and talking amongst each other about the chief's mental state. Since he took over, Oates has mandated that all officers wear a police baseball cap as part of their uniform on holidays and other special occasions. Last New Year's Eve, according to numerous sources, Oates was driving his Ford Explorer on Washington Avenue when he spotted a uniformed city employee who wasn't wearing a ball cap. Believing he'd nabbed one of his officers out of uniform, I'm told that Oates rolled down his window and proceeded to berate the employee for not wearing the ball cap. But had Oates looked a little closer he might have noticed that the employee was a parking enforcement officer and not a cop. "You stupid f**k," one commenter wrote on the Miami Beach Police Department message board, "Did you not notice the fact that he has no f**king GUN? [Y]ou noticed no police baseball cap, but you did not notice the parking uniform with parking patches and a f**king parking electronic ticket machine." 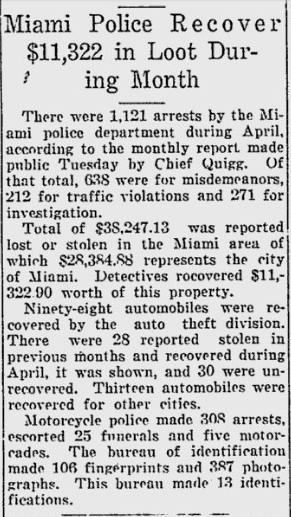 From the Miami Daily News, May 4, 1927. Note: Miami's population in 1927 "unofficially stood in excess of 100,000." MIAMI BEACH, Fla., Jan. 2 — RICHEST ROOKIE EVER?? 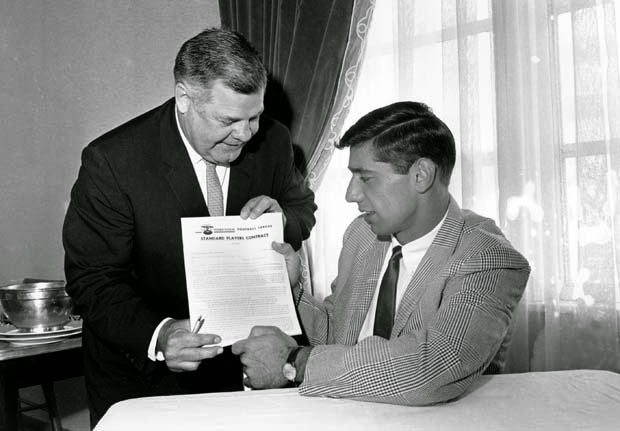 Miami Beach - (AP) - Brawny Joe Namath, son of a struggling Beaver Falls, Pa., steelworker, signed the contract yesterday that made him the richest rookie in the history of pro football -- and probably any other sport.